For more information please email her at sandymcafeemusic@gmail.com or sign up on the mailing list to be included on the HEART in the HOUSE VIP list. 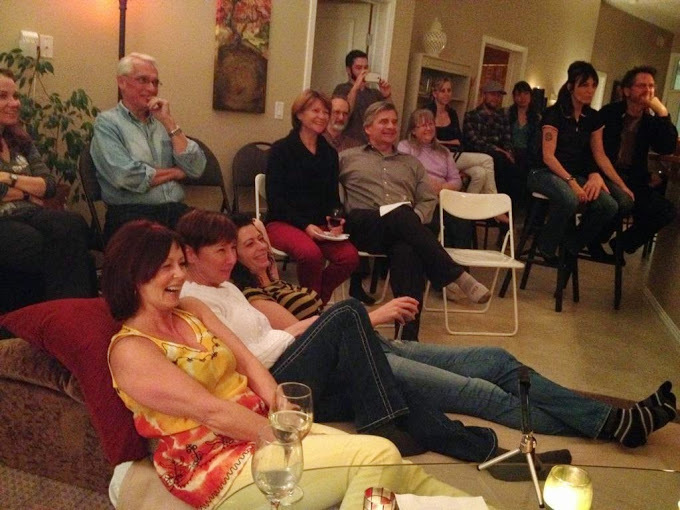 If you have never experienced a house concert you are in for a treat. The intimate acoustic environment allows you to connect with the music, the lyrics and the artist in a very memorable way that you will want to share with friends again and again. Whether you choose to do one-off event, one concert a year or one a month you get to choose. Our happy hostess (Dale shown above closest to the camera) has been a regular House Concert Host and we fill her home with musicians and friends from time to time. Her space is a condo and we manage to very comfortably fit about 36 people at the concert you see above in the pictures. This concert was a joint one with Sandy McAfee, Michael Averill from Vancouver and local brilliant Cellist Nils Loewen joining us both to add some flavour. Hosting is such a great way to connect to music and community. Sandy will come to your space and assess what will work for you by creating a HOST Profile so she can match the performances that suit you best. Sandy is currently working with a number of local and touring performers to develop an evolving roster of varying types styles suited for this type of performance environment. The primary focus is on local performers creating an increase in performance opportunities. Touring artists are considered under specific criteria. For more information please contact Sandy directly via email. Sandy is currently developing multiple hosts with various sizes of homes and musical tastes. She works closely with the hosts in all the details including choosing performers, pre-assessing the location for seating capacity, etc. This process is ongoing and still developing.